Brochures are typically used for informational purposes, but the type of information that it shares is up to you. It can be very general company information or very specific information on a product or service you provide. 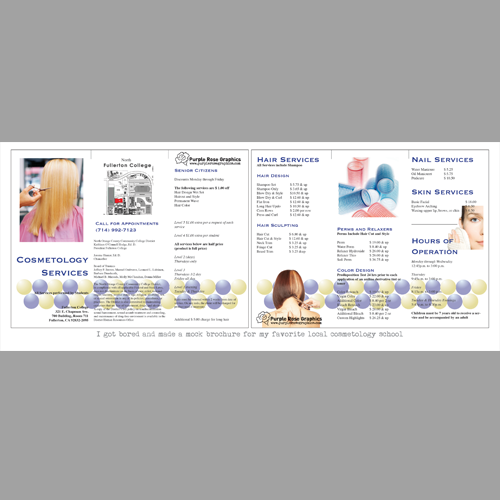 Brochures can be one of the most useful pieces of marketing your Orange County based business can have! There are a lot of different styles of brochures. The first thing I usually do is to determine the style of brochure. This includes how it is folded and how many pages. Sometimes multi page documents such as annual reports, for example, are called brochures also. If you have text, logos, or certain photos I will need copies of those. I will do the layout and send you a digital proof with in 3-5 business days of receipt of payment. Your estimate price includes a few rounds of prepaid changes so that we can edit your brochure until it matches the rest of your marketing. Contact me today to find out how Purple Rose Graphics can help you!